Learning how to tile a bathroom floor? 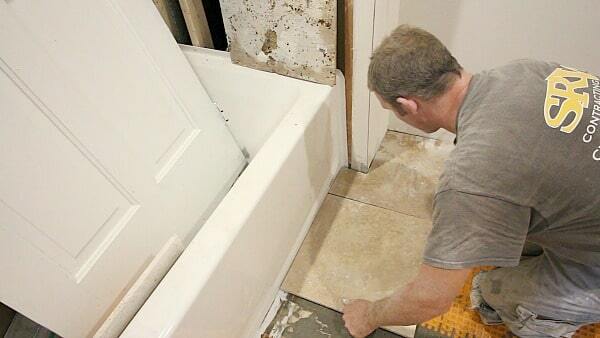 Today’s tutorial has a ton of great tips for setting travertine tile in a bathroom. And by the end we want you to feel more confident in doing this project. A few weeks ago Steve had to set travertine in a small bathroom. But the back of the tile was uneven, as are a lot tiles of this style. Many homeowners or inexperienced tile setters can make mistakes when using travertine. So we decided to show you several methods for getting level tiles with uniform grout joints. 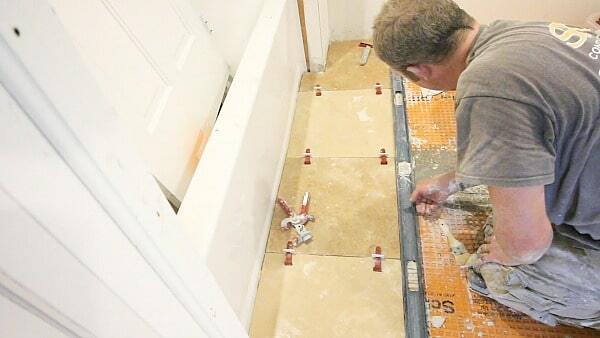 We use a special tile leveling system called T-Lock to help with large format tiles. And think you should consider it when installing a tiled bathroom floor. What’s the First Step for Tiling a Bathroom Floor? Without a doubt the first step is to check the subfloor is level. Place a 6 foot level on the subfloor and ensure it’s level on all sides. Sublfoors can be self-leveled whether they’re wood or concrete. Old wood subfloors that are water damaged should be replaced. It’s well worth the money. DITRA is our preferred uncoupling membrane. We feel it’s a must because tiles are less likely to break and the entire bathroom floor can be waterproofed. That said, we also like Hydro Ban if the bathroom floor is already high in the doorway. Clean the subfloor and dampen it with a sponge. Apply modified thin-set with the flat side of the trowel to the entire subfloor. This process ensures the thin-set is absorbed in the subfloor. Then used the notched side of the trowel to comb more thin-set into the subfloor. All the notches should face the same direction. Embed the DITRA into the thin-set with a float. DITRA should be waterproofed at the seams with KERDI-BAND and at the tub using a combination of KERDI-FIX and KERDI-BAND. Our DITRA tutorial has a ton of details on how to do this. In addition, if you want a heated tile floor DITRA-HEAT is a phenomenal option. Tile can be set immediately over top DITRA and that’s exactly what we did…installed the DITRA then started the tiling process. Steve recommends starting the tile at the tub and working toward the opposite wall. Dry fit the first row to check the fit. In the video we mention how some tiles will have to be custom cut at the tub if the tub bellows out or has an irregular shape. Once the first row of tiles is dry fitted, apply unmodified thin-set to the DITRA and fill in all the waffles. 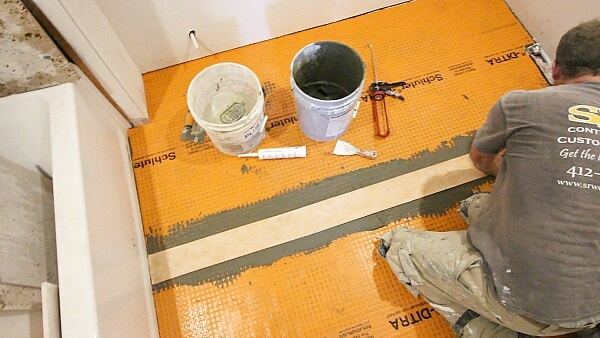 ALL-SET, Schluter’s thin-set, can also be used instead of unmodified thin-set. Then directionally trowel thin-set such that all the ridges face the same direction. More on why in a second. Back butter the travertine tile to fill in any depressions. This will help improve the bonding of the tile to the thin-set on the DITRA. Set the first tile in the DITRA and position it about 1/8″ to 1/4″ away from the wall. This provides room for expansion and contraction. 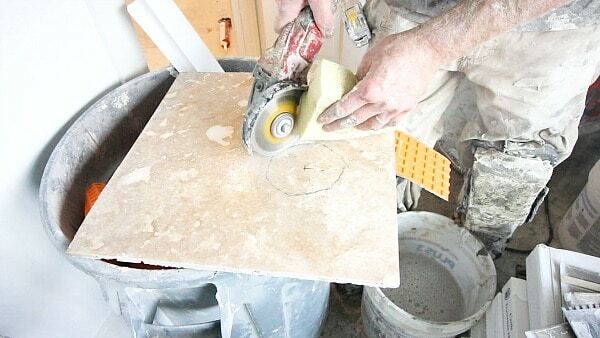 Remove excess thin-set from the edge of the tile with your index finger. It’s good to wear gloves while doing this to prevent skin burns. 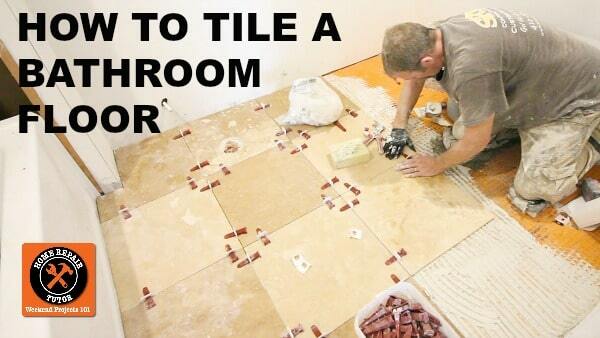 In the video you’ll see Steve adding while clips under the tile edges. These clips are part of the T-Lock tile leveling system which helps keep tile heights all the same. 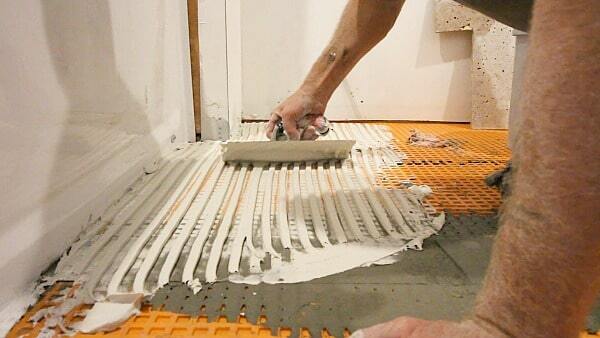 Tile leveling systems are important for tiles with edges that are more than 15″, e.g. 18″x18″ tiles. Large tiles can bow or have irregular edge profiles. T-Lock helps eliminate tile lippage and since the tile spacer is integrated into the clip there’s typically no need for additional spacers. Add two T-Lock clips to each side of the tile where another tile will meet it. Clips should be 2 inches from the outside edge. Back butter and set the next tile. Place the T-Lock wedge through the clips and tighten them by hand or with T-Lock pliers. Continue this process until the first row is complete at the doorway. Steve recommends having the tile end under the doorway. Check the tiles for straightness using a 6 foot level and continue the tile setting across the bathroom. Bathrooms, well most anyway, have toilets. How can holes be cut in the center of a tile for the toilet? Use an angle grinder with a diamond blade. The same method is used when tiling shower plumbing walls. FYI, Bathroom Repair Tutor has more detailed videos on tiling showers and remodeling bathrooms. Our video has more details on how this is done. But please be careful, take your time, wear safety gear, and do it outside if possible. Disclaimer: angle grinders are dangerous and we’re not responsible for bodily injury!! Steve is obviously a professional and uses an angle grinder all the time to cut tiles. But this tool is widely used in the tile setting industry and will make tile setting a lot easier. Our preferred angle grinder, because of the dependability and high RPMs, is Fein’s WSG7-115. Pipes often times protrude through the floor for toilets and vanities. Holes can be made in tiles using a diamond hole saw. Typically a 1 inch hole saw works well for 1/2″ pipes. Dipping the hole saw in water every few seconds preserves the diamonds and bit life. 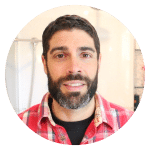 In the video we show not only how to tile a bathroom floor but also all the details involved in getting amazing results. Watch the video and copy Steve’s tips…you’ll be happy you did. If you’re interested in T-Lock we recommend getting the 1/16″ Kit for large tiles. Also, if you’re tiling a bathroom floor next to a curbless shower click here for our tutorial – it’s very helpful. It’s fantastic for floors or showers with large tiles, e.g. 12″x24″ or wood plank tiles. If the subfloor is a wood subfloor you’ll use modified, however if it’s a concrete subfloor you will use unmodified. You left this important aspect out. You’re correct Jay, Schluter calls for modified thin-set under DITRA for wood subfloors and unmodified for DITRA over concrete. 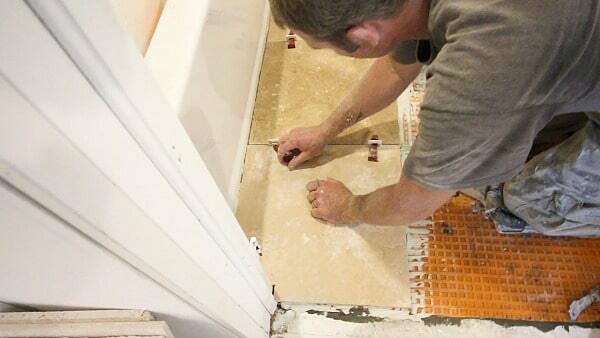 Oversight on our part, we used Schluter’s ALL-SET under the DITRA and that can also be used for setting the tiles. [author’s name] tTamazing too! I love how you put together these information on. Easy to read, very relatable and great tips! Can’t wait to read more! Thanks Ralph, hopefully our flooring tips help you with your project. Always feel free to ask us questions, we’d be happy to help. My husband installed our bathroom floor, used a leveler compound. The tiles are plank style. After 3 days some planks look uneven and the grout popped out. The subfloor must not have been even. He tried adding extra glue in areas while tiling. Can anything be done now to hold the grout in? Hard to say Peg without knowing the entire installation process. Do you know the thickness of the subfloor and whether DITRA was used? As a professional tiler I get a lot of calls regarding cracked tiles or grout coming loose. 99% of the time it is due to tiling directly onto wood. Ditra would almost always have stopped this from happening and I rarely tile floors without it these days. Yes its expensive but not as expensive as ripping everything out and redoing it properly. Thanks Cathlene for your feedback and we agree. DITRA is one of the best isolation membranes for either wood or concrete subfloors. 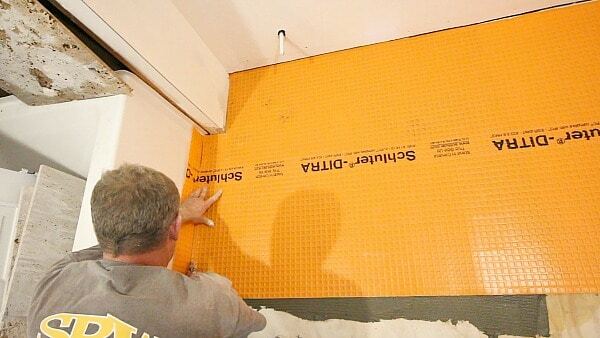 We wouldn’t recommend tiling directly over anything without an isolation membrane. Plus, the nice thing about DITRA is the ability to completely waterproof the floor. This is especially important outside bathtubs or showers.